Yesterday I posted our plans for this year’s garden. This was last year’s garden if you’re interested in seeing how things have changed. 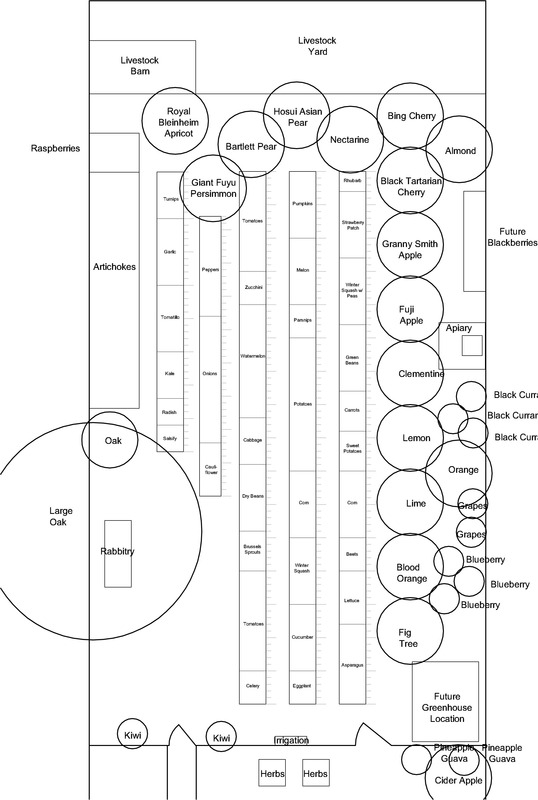 Today we’re going to wrap up the “How to Layout….” series with Companion Planting. The premise of companion planting is to confuse pests, create symbiotic relationships, and mimic nature. Some plants also don’t do well next to each other. A good example is when I planted garlic and beans together once. Onion family plants just don’t like beans. We ended up losing the entire garlic crop that year and the beans didn’t do very well until after we pulled out the garlic. The drawing to the left is of our garden layout from last year. You’ll notice that not all of the same plant are near each other. Tomatoes, beans, corn, squash, watermelons, lettuce, peas and garlic are split into multiple areas. The large circles represent our fruit trees. For scale, the small dashes represent 1′ increments and the longer dashes are 5′ increments. So the longest beds are 75′ long x 4′ wide. If a vegetable you want to grow isn’t included in my chart then refer to other family members to establish it’s ally or adversary. Click on the chart below to enlarge. Thanks for coming up with such a useful chart and series. It will save me a lot of time, now that it's all figured out for me. I'm sincerely impressed with your organization! Bravo! Nice adversary chart, and so important when planting out the garden! 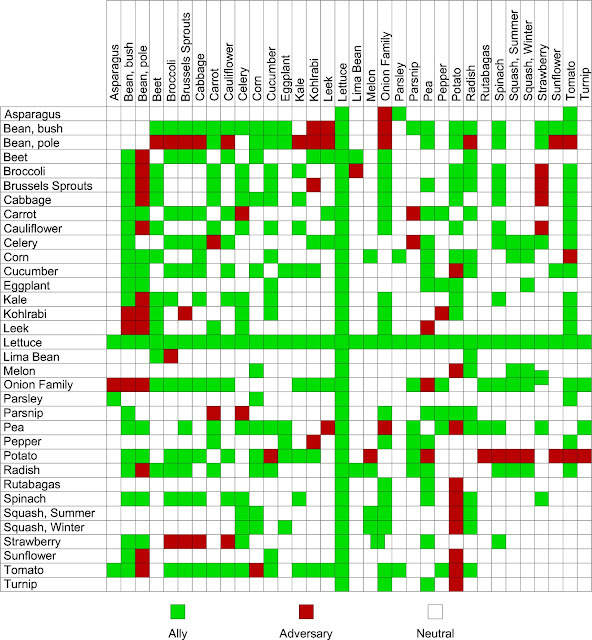 I shade our garden planner similarly, as I often end up forgetting which veggies don't play well together. My, my! A great resource to have when planting! Now I will have to go look at my garden and see if I have anything planted by something it doesn't like. Kind of like grade school! Rachel, that chart is priceless! Thank you! I have space in front of my pole beans and now I know what their best/worst neighbors are. Thanks Rachel – again! This is fantastic! It has saved me so much time, thank you! Your the best Rachel for putting this all in such a handy dandy chart! I printed it out right away as I had been using a list of what went well together and that was cumbersome and time consuming. I had been meaning to make some kind of graph so that I wouldn't spend a solid week on planning, but I'm the queen of inefficiency. Rachel to the rescue! I might finish my garden planning in 2 days now 🙂 Thanks for the series. It has been immensely helpful. Oh, sweet Jesus, that's complicated. Maybe, I'll just grow carrots. Or hops. That's it. Just hops. This is really helpful! I was reading the other day a magazine and it said about growing potatoes and peas in the same bed! And that it was helpful and now that I see your chart they are enemies! I was going to plant them together!! Interesting that they would recommend planting peas with potatoes. Peas are nitrogen fixers. Nitrogen is great for growing foliage but not so great for root development, which is what you want with potatoes.